When travelers arrive in New York City, the city feels familiar, like they’ve been there before. Maybe it’s the pictures found in magazines and movies or the souvenirs that fill shelves and hutches across the country. In any case, the big city leaves big impressions. No doubt New York’s use of branding and advertising has contributed into making it the most well-known and iconic city in America. As a city, Bangor has many things that go into making it a beautiful place: The powerful Penobscot River, charming local businesses and events and activities that enriches everyone’s lives. But the one thing Bangor doesn’t have is a clear icon. “We should embrace the things, icons and imagery that make Bangor unique and creates a stimulating, cohesive atmosphere,” Mark Ricketts, a Bangor illustrator, said. Depending on who you ask, you’ll hear a number of different opinions. “The river is what I think of," Lee Cyr, a Madawaska citizen, said. "I guess that’s why I think the Waterfront Concerts are such an appeal." For Lillian Barnes, you need not look any farther than Bangor’s steeples and historic Thomas Hill Standpipe to find an icon. But for many Mainers, the icon has to be Bangor’s biggest resident. “Paul Bunyan. That’s [the icon] for sure. It’s been there 50 years that I know of,” said Paul Oxgen of Camden, and he's not alone. Troy from Bucksport feels strongly that Bunyan is the city’s icon as well. “It’s the first thing you see [when you get to Bangor],” he said. However, if you look around Bangor you only see a single statue dedicated to Paul and little else. “As a designer, I think branding is important. Bangor has a proud symbol that sets it apart from other towns. You see that statue and you think Bangor,” said Ricketts, who designed the popular Bangor Green Drinks logo which features Paul Bunyan. So why doesn’t Bangor welcome its native son? Well, Bangor can follow the lead of other cities that promoted those symbols that made them special. Towns all around the United States have taken steps to create and promote icons, even a few in Maine. Belfast sought to capitalize on an identifiable icon - a black bear. The Belfast icon was spread about, and residents and visitors were encouraged to interact with them through photographs. From 2000 to 2003, Belfast celebrated Bearfest, which drew visitors from across the state and country. Unfortunately, a lack of support brought Bearfest to end in 2004, but Bangor’s Paul Bunyan need not follow the same fate. Bangor can promote Paul Bunyan as an icon. Local businesses can follow the example of Green Drinks and customize Paul Bunyan statues to suit their image. This will allow visitors to see and support local businesses, while also bringing more color to the Downtown area. Mainers already journey from across the state to enjoy all the city has to offer from the blossoming night life to events at the Cross Insurance Center. 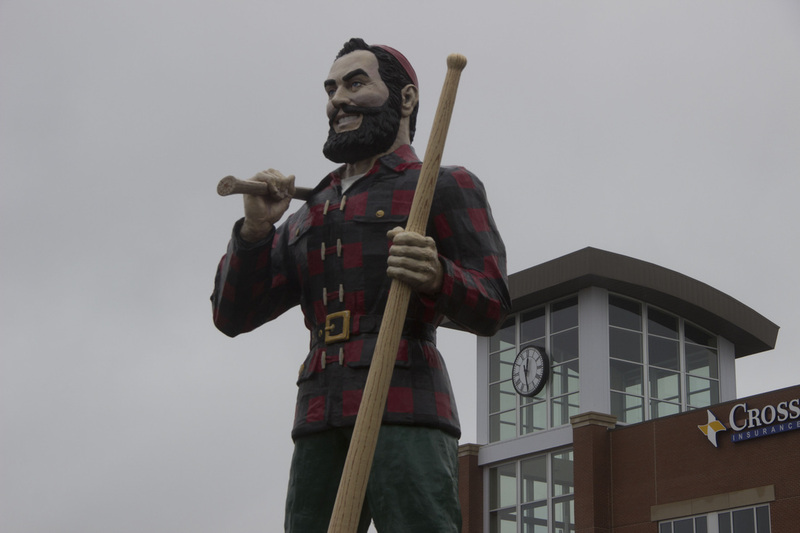 Establishing Paul Bunyan as an icon can help local businesses to stand out and build stronger connections with their loyal customers. An icon could also b incorporated into events held in town so that when people visit these events, they will know Bangor as Paul Bunyan’s home. Already there was a Mr. and Mrs. Paul Bunyan competition held on New Year's Eve that people could participate in. If more events work to incorporate him, it could prove to be a giant step in the right direction. By taking action now, Bangor can develop and grow its icon, and by 2020, Bangor can be known as the real birthplace of Paul Bunyan.